Here we are at the end of December, and the final installment of this Homeschooling High School Blog Hop. This month's topic? Graduation. While we are not quite there yet in our own journey, we will be soon. I just want to share a little of what I've seen and have learned from our friends who have graduated in recent years. Mom and Dad, these are not as complicated as everyone would lead you to believe. A simple transcript for your student will go further than trying to come up with a WOW factor. This is an area where less is more. 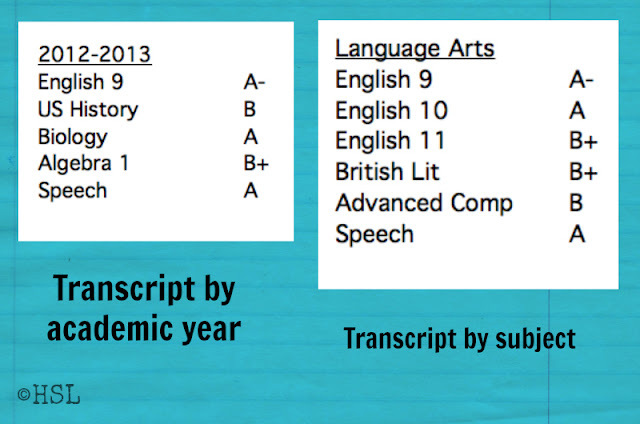 There are two basic options to create your student's transcripts: 1- by year, or 2- by subject. Either version should work just fine for submission to colleges, trade schools, etc. Even if your student is planing to go straight into the workforce, you still need to create their transcript now in case they need it later. If you're creating a transcript by year, simply list each course they took, and their grade. You will want to make sure you understand how YOUR state assigns credits (per semester or per year) and add that as well. The other common choice is arranging their transcript by subject. Many families are choosing to do this if their student took either more or less than the traditional four years to finish High School. I prefer this format because of the ease of seeing if the student completed the necessary state requirements for each subject. Once again, you'll need to add you student's credits based upon how your state assigns them. Our state is different than many surrounding states in that it assigns a credit per semester, whereas other states assign half a credit per semester of completed work. Around here there are three usual options for Graduation, although you can adjust it to however fits your graduate's wishes. This is where several families, maybe a whole county's worth of Seniors go together and have what we would call a traditional graduation ceremony. This includes the cap and gown, the graduates' march, walking across the stage... the works. You may also have the option of joining a state-wide graduation ceremony. Word of caution ~ If you're going to do one of these, you will need to set aside time and money throughout your student's senior year to attend all the planning events and meet the payment deadlines. Some statewide ceremonies cost upwards of $200 or more and have very specific deadlines to meet. This is where your graduate is in the spotlight. You may choose to have this with another family (like your daughter's best friend who is also graduating.) These are typically held in a church or home, and include the parents and the students sharing from their hearts. Often at the end the attendees are encouraged to come forward and pray for the graduate. More and more families we know are skipping the ceremony part and having a sole focus on a graduation open house for their student. The parents give the student their diploma, tell them they're happy they've completed High School, and then everyone enjoys the open house without the stress of preparing for a ceremony. While a traditional graduation open house used to last 2-3 hours, many home educating families are choosing to set aside a whole day, or at least a whole afternoon and evening for fun and fellowship. Whichever option you choose for graduation, remember to keep the food for the open house simple. Simple people! When your foods are sandwiches, finger foods, or a taco bar, anyone can help replenish the food table, and you will actually get to spend some time talking with the guests! 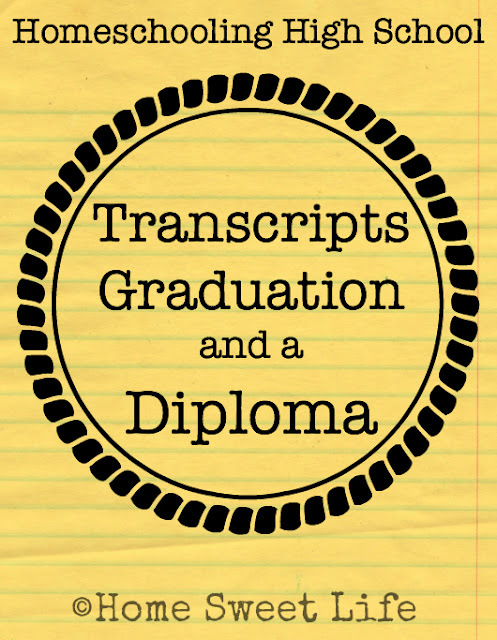 Just in case you haven't thought about it yet, yes, your homeschool graduate will need a diploma. Many jobs want to see the actual diploma, not a transcript, to hire your graduate. There are a few good companies that you can find online that produce lovely diplomas for you to purchase to give to your graduate. Something to think about here: have you ever named your homeschool? If not, and you'd like to put something other than: John Smith graduating class of 2016 Smith Homeschool, then NOW is the time to be thinking about it. You might want a catchy name, or one with Biblical meaning. Whatever you choose for a name, double check how long it will take to receive the diploma once you order it. You are not the only family ordering this month, and it is much better to have it arrive early, than not arrive until after the open house. 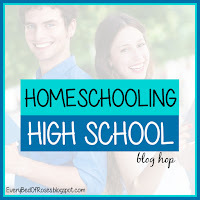 We hope you've enjoyed this Homeschool High School Blog Hop. 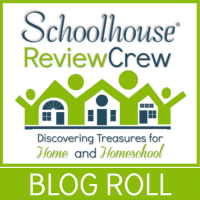 To read more posts on Homeschooling with High School aged students, subscribe to our blog, or follow us on Pinterest, Google +, or Facebook! Click the graphic below to find all our friends' posts on Graduation! 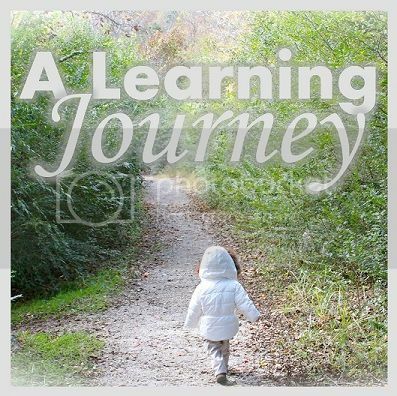 Kym @ Homeschool Coffee Break shares: Graduation and Beyond! 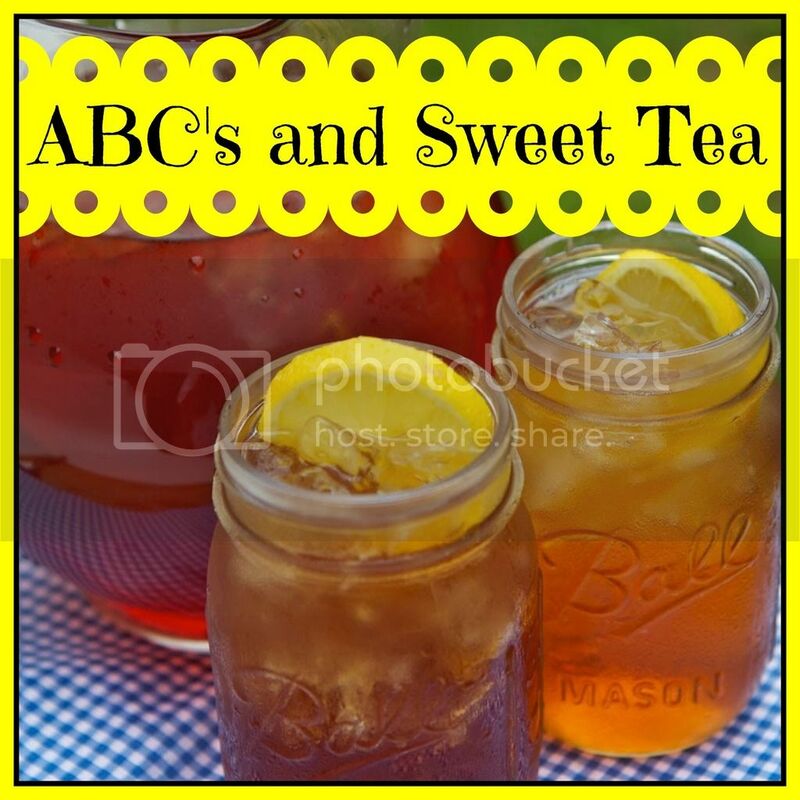 My friend Kym is hosting High School Lesson Book- All your High School Posts @ Homeschool Coffee Break. Stop on by to see what others are doing in their High School Homeschools each month during 2016. They could not stay forever in the presence of the newborn King. Seeing Jesus had an enormous impact on their lives, and yet, their jobs as shepherds, and the needs of their sheep called them back to the fields. How will the impact of spending time in the remembrance of Christ as a babe impact our lives in the coming week, next month, next year? Will we be different? Will our words be kinder, will our actions bring glory to God? Will you allow God's impact to show forth in your tomorrow because of what He has done for you today? Are you changed by time in His presence? Too often we try to put Christ's impact on our lives back into a box about the same time as we pack up our Christmas decorations. This should not be! I want my life to be different because of Christmas. I want to live my life in a way that the joy I find in celebrating the birth of the Messiah carries forth into the rest of the year. I do not want to put aside Jesus when I put away the ornaments. I am choosing to put aside myself and cling to Christ. He has not made me perfect yet, but He is perfecting me. Will you join me in choosing to let Christ impact our everyday lives long after the world puts away Christmas? Will you choose to make time for the worship of Christ amongst the care of meeting those needs of your families and jobs? May we join together as the body of Christ, glorifying and praising God! Go tell it on the mountain, over the hills and everywhere, go tell it on the mountain, that Jesus Christ is born! Sometimes, it is overwhelming. Often it can be depressing. The world of Media tells us that we are bad parents if we don't DO and GIVE all these things. 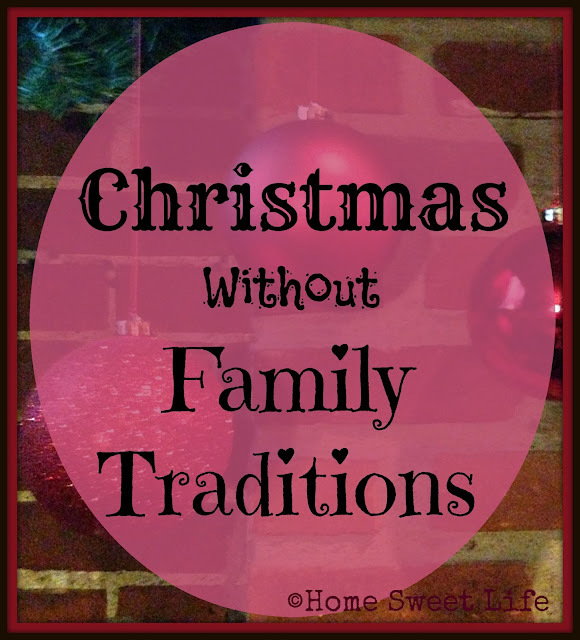 I am not against having family traditions. I just hope to hold a realistic view of how they should or shouldn't fit into our celebration of Christmas. I have three concerns about family traditions at Christmas. Please allow me to share what has been on my heart lately. Our lives change from one year to the next, and while I can understand the comfort that many people receive from having the same family traditions repeated every year, I have to say that I'm not much of a tradition-ist. First: Some family traditions set up unrealistic expectations for the next year. If you tell your children (or they infer from your comments) that this event or gift is going to be a family tradition for each year, there will be disappointment when you cannot produce it again next year. Or worse yet, they don't like the event and end up worried that they will have to attend every year. Maybe your daughter loves the idea of seeing The Nutcracker Ballet every year, but your son is bored out of his mind. How will they view this tradition next year? Are you willing to be flexible and make choices based upon the whole family's desires, or are you going to drag unwilling members along anyway? There is a balance to be found between teaching your children to be a good sport and enjoy watching others be happy and being a parent who shows no compassion to those who aren't having fun. Each family has to make these decisions on a case by case basis. Maybe the ballet is a Mommy-daughter event, while the guys go see movie together, or go watch a sporting event. Be realistic. Second: This is a big one MOST people avoid talking about: Most Family Traditions cost money. Maybe you think they're not that expensive. Perhaps they're not. But to the parents who are struggling to feed and clothe their children, or a working class family that needed to replace the furnace, have the car repaired, or take a sick child to the Doctor last month, being unable to keep these traditions can make them feel like a failure. Hardworking people who are focused on their families are often making a decision between buying food for Christmas day and purchasing a present. That last $20 before payday can only be spent once. If you are in this situation, you have my prayers. We've been there, done that. God has always provided. Usually it was not in the way we expected, or even in the way we would have chosen, but He never failed. So what if our girls didn't get to go to the movies with their friends or watch a play? A lack of presents under the tree doesn't mean we don't love our children, it usually just means we love them enough to do what is best for them, even when it doesn't line up with what happens in the house next door! It is a much more important thing to teach your children to rely upon God than to teach them to look forward to traditions that may be unrealistic for next year ~ if ever! If you truly want to start some family traditions, focus on ones that will and can be repeated without cost. Read in the Book of Luke about Christ's birth, sing Christmas Carols, talk about what God has done for you this past year. Choose to focus on being thankful for all the blessings you've received, not what you might have missed! Which brings me to my third concern: Do your family traditions glorify things, or do they focus on Christ? We as Christians NEED to get back to the reason we celebrate Christmas in the first place: the true reason Jesus was born was to live a sinless life and give His life as a ransom for ours! The angels appeared to the shepherds with a glorious message: "Fear not: for, behold, I bring your good tidings of great joy, which shall be to all people. 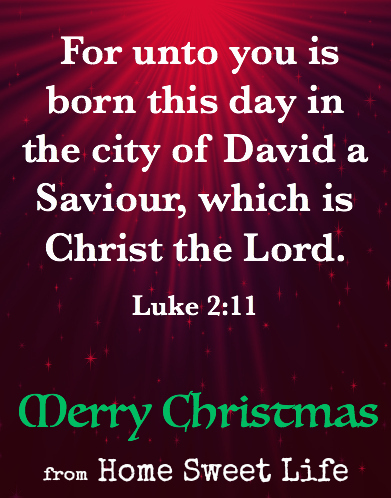 For unto you is born this day in the city of David a Savior, which is Christ the LORD." If your focus this Christmas is on the birth of a Savior, then your family will have all they need. Christ's birth, life, death, and resurrection show us how great is our need for a Savior. He shows us our Sin, and He gently says "Come unto me, all ye that labor and are heavy laden, and I will give you rest." Only Christ can forgive our sins. When we bow before Him, and accept His gift of forgiveness, true Joy fills our hearts. Enjoy time with your family and friends, whether you have family traditions or not. Through it all, keep your focus on Christ! What If I Don't Feel Festive? 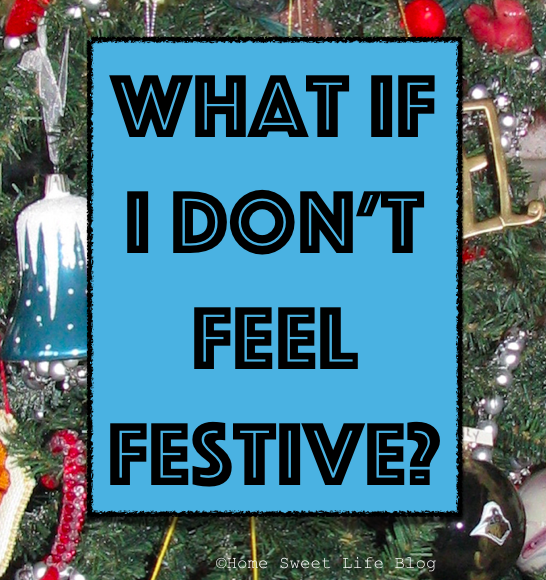 What if I don’t feel festive at the holidays? Has that thought ever crossed your mind? We’re about a week from Christmas, and frankly, during some (ok, many, recent) years at this time there have been days I didn’t feel very festive either. Sometimes life has a way of dragging us down, especially around the holidays. I’ve talked with my friends over the past few years and some of them have shared that they have days, sometimes even a whole holiday season, when they just don’t feel festive. They don’t feel like celebrating Christmas, like having a party, like seeing their family, like decorating the house or sending cards, like . . . [insert your Christmas tradition here.] The reasons are varied, and to protect the not-so-innocent of our families and co-workers, I’ll mix their reasons in with some of the ones I’ve endured in my adult life. You might recognize some of these un-jolly reasons yourself: death of loved one near the holidays, being laid-off or under-employed during the year, miserable weather, family squabbles, plumbing problems, sick children, pettiness amongst your co-workers, depression, lack of time to see your family. Do any of these resonate with you? You are not alone. There are a whole host of reasons why you might not feel festive at the holidays. What matters most is not what has you down, but what you do about it. Are you asking God to help you separate the reasons you don’t feel festive from the head and heart knowledge of WHY we celebrate Christmas?!? Celebrating Christ’s at Christmas isn’t about our happiness, it is about our JOY. We need to realize that our enemy wants nothing more than to rob us of the joy we have in Christ! When we lose our joy, we don’t live a humble, yet victorious, life of glorifying Jesus. So how do we make ourselves joyful again? Simply put - we don’t. Joy is a gift that Christ lavishes on us when we spend time in His presence. We can’t find or create it artificially with things ~ that is just a happy feeling. What we need is to spend time with God, reading and thinking about Christ’s birth, His death, and His resurrection. 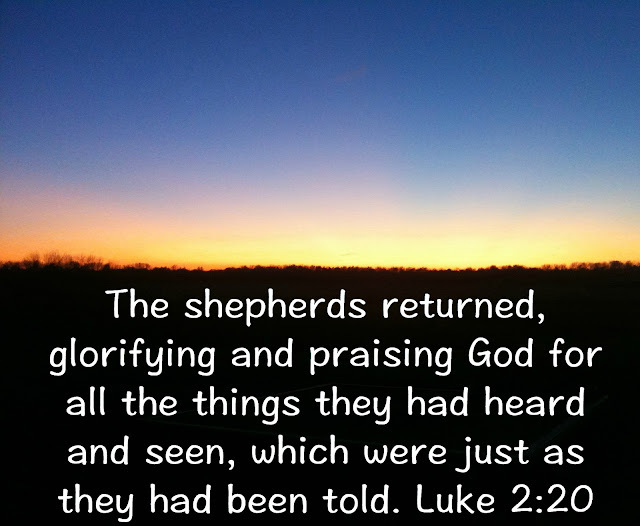 When we are once again overwhelmed by His great mercy at the sacrifice He gave in our place ~ Then joy comes! When we get our minds off of the temporal troubles we’re facing, and put our eyes back on Jesus, we see life in a whole new perspective. Get out your Bible, read about the angels coming to tell the world of Christ’s birth through some shepherds, read about how John prepared the way for Christ’s ministry, read about the crucifixion, and then His resurrection. When we remember the whole story, that the death and resurrection of Christ could not have happened without His birth, we find that God grants us peace, joy, and love for others. When I realize once again how great was Christ’s sacrifice, for me, a sinner, I am overwhelmed with joy. I am praying that you will find your joy again in the baby in the manger Who grew up to be our King! Break out those Christmas Carols ~ we have a reason to sing! Joy to the World! Do you appreciate the small opportunities for fellowship that abound this time of year? Are you willing to lay down your own idea of what should get accomplished each day in order to follow what God wants you to focus on? I am thankful for all of the fellowship opportunities that God has so graciously granted to us recently. My friend didn't scramble to try to make her home look perfect, or offer food they didn't have ~ she simply opened the door and invited us in. True, simple fellowship amongst friends, especially Christians, should be the norm, not the exception. It should be about being present, sharing one another's burdens, and rejoicing in the mercy God bestows upon us so lavishly. Stop trying to present an image, and open yourself to the wonderful freedom that comes from just being you. Embrace your friends as the true gifts from God that they are! Reach out to someone and make a new friend. Invite someone over for a short visit, it may turn into the best thing you've done all week! A small opportunity to spend in fellowship, whether its over a glass of water or a mug of hot chocolate may be just what they, and you, need this week. In the hustle and bustle of the holidays, we need to remember to value people over things, to seek out the Christ Child in our Christmas celebrations, and to witness the miracles that happen everyday! God does not call us to live a glamorous life, or even an easy life, but He does call us to live a joy-filled life!!! 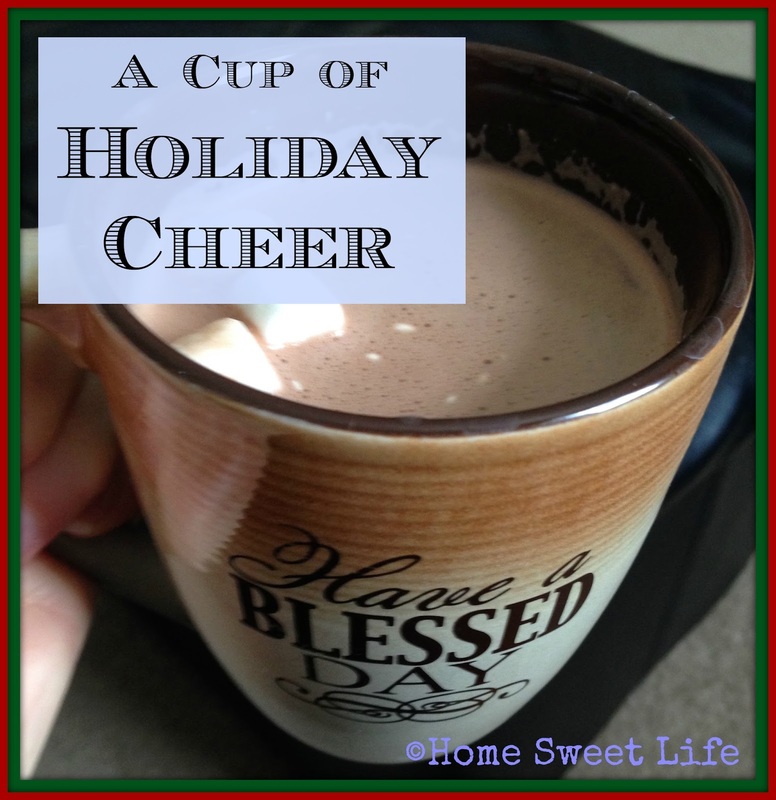 It is time to be thankful for a cup of holiday cheer! What do your teens do for fellowship? Seriously, have you thought about providing some down time for them and their friends? How do you provide fun in a safe environment? How do you get to know your children's friends? 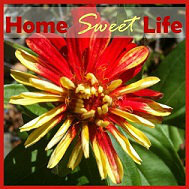 Do they feel comfortable in your home? Opportunities to spend time with their friends abound for younger children, yet we often need to be intentional about providing time for our teenagers to “just chill” with their friends. Whether or not your teens attend a youth group or participate in sports, they may need you to help them schedule fellowship with and for their friends. Sometimes they're so busy with school, volunteering, and jobs, they struggle to find time for true fellowship. Kurt and I know it is important for our girls to have time with their friends. We know Emily and Arlene have some great friends, and we were happy to host Game Night this past weekend. 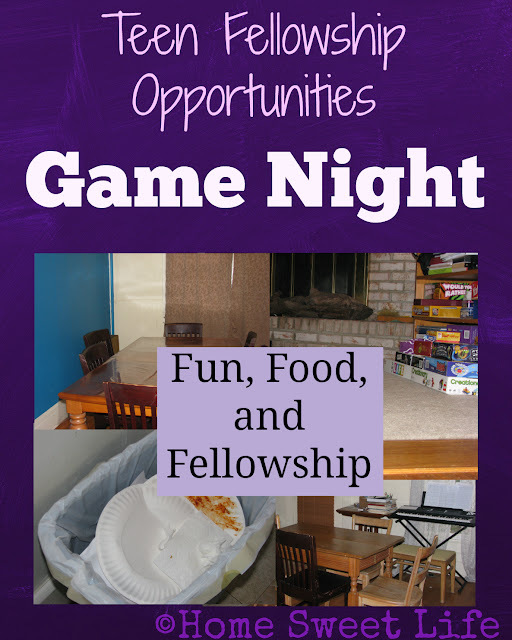 The group of friends for Game Night varies some based upon who is hosting, and how much room they have to fit in all those teens and young twenties. We have two daughters, but last Friday we had 18 - that’s right - EIGHTEEN lively and loud teens and twenties in our home! The guidelines are simple: pick a date, check with your parents, and tell your friends. Our group has a 13 and up age requirement…the oldest are usually around 23-24, but there is no up limit, just depends on who you want to invite. We have plenty of board games at our house, but often the teens will bring their favorites with them when they come. With our group of teens you can be pretty sure that there will be an euchre game or two . . . or perhaps three break out sometime during the night! Kurt and I retreated upstairs when it was time for game night. 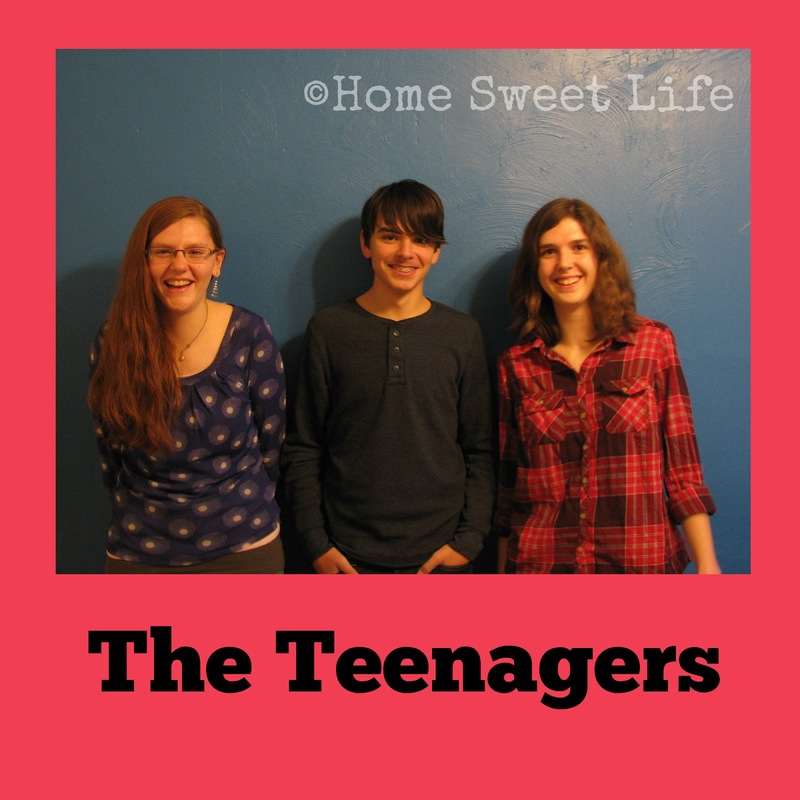 The parents are always available if a need should arise, but the teens run their own show. We do check in sometime during the night . . . usually to raid the snack table!!! I want to give kudos to the other parents of the girls’ friends. We set a timeframe for 6-10 p.m. I’ll be honest, I love their friends, but I didn’t want to stay up until 11 p.m. At 10:10 p.m. Arlene came upstairs to let us know that Game Night was over and their friends had all gone home. When Kurt and I came downstairs, the only evidence of the 16 extra kids was a full trash can in the kitchen. They had cleaned up after themselves and put all the furniture back before they left. Moms and Dads, let us encourage you to host a Game Night for your teens and their friends. It doesn’t matter if its just your family and one or two other friends, or if you invite three dozen teenagers to come over. What matters is providing the time and space for teens to fellowship! If you get the word out now, there is still time to plan for a New Year’s Eve Game Night! Be sure to follow us on Pinterest or Facebook, we’ll be sharing other ideas for teen fellowship next month! Looking for a fun holiday treat for the whole family? 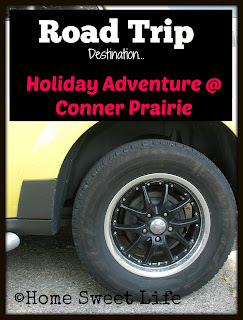 One of our favorite destinations in December is Conner Prairie in Fishers, IN. Their Holiday Adventures program lets guests experience the sights, sounds, traditions, and smells of 1836 Indiana! 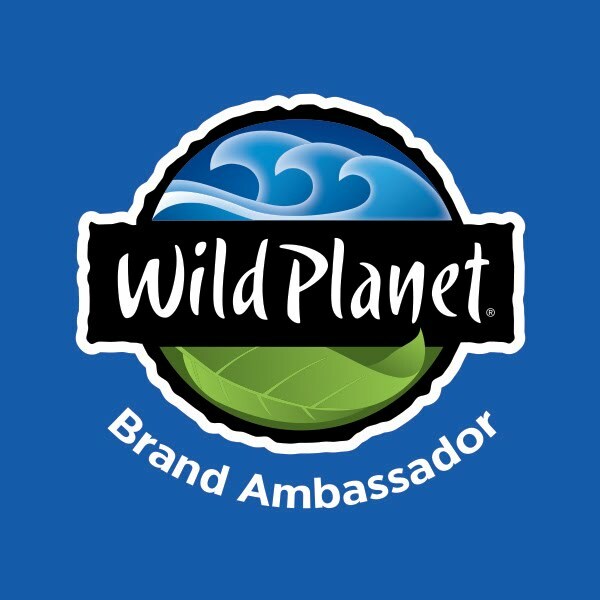 We've been members of Conner Prairie for more than a decade, and this is one of MY favorite programs! 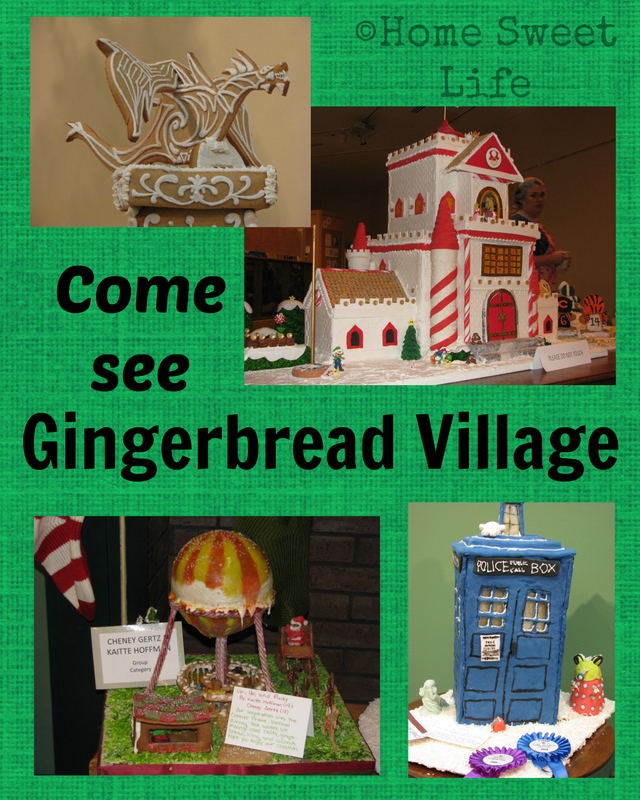 In the museum center, your family can browse through Gingerbread Village. Every year bakers of all ages (and skill levels) compete in this friendly quest for confectionary surprises! From scout troops or families with young children, through teens, adults, and even professional bakers, come see what this year's imagination has created. Every entry MUST contain gingerbread, and the variety is astounding. Past years have had a beach, the Conner House, and igloo, barns, summer camps, and so many more fun designs! 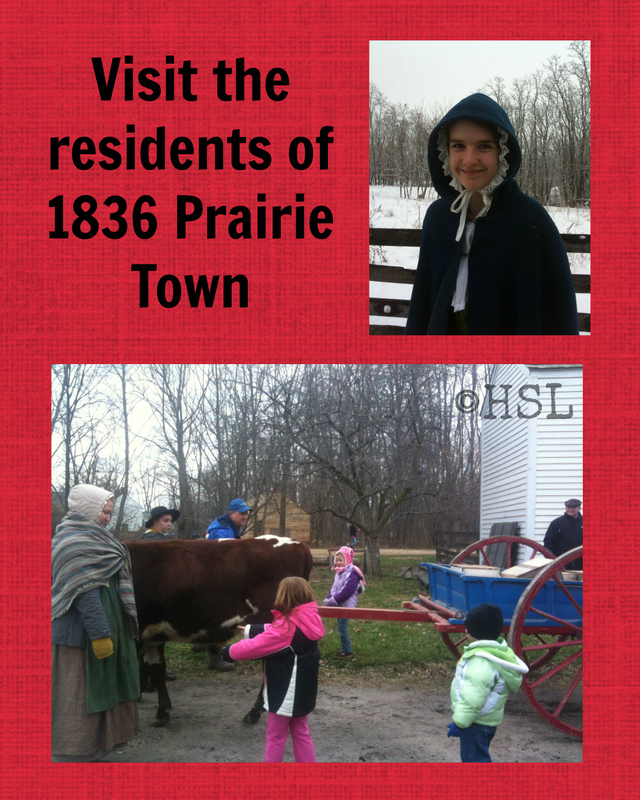 On the outdoor grounds, guests can stroll through 1836 Prairie Town. You'll meet residents hard at work doing winter chores, and you might even get to help! As you visit the homes and businesses you will learn about the traditions the various residents celebrate during the winter. You'll meet some families who celebrate Christmas, and learn why other don't. After all, celebrating Christmas wasn't popular in the USA until the 1840's, and didn't become a Federal holiday until 1870. 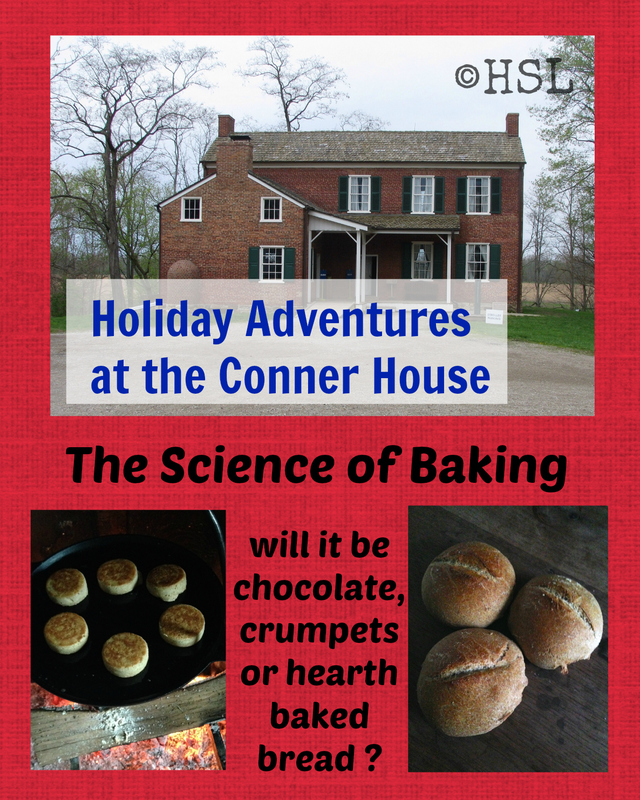 At the 1823 Conner House, you can join in with staff and volunteers to explore the Science of Baking. What will you find? Depends on which day and what time you visit. Often you'll find them baking bread on the hearth (in cast iron,) mixing up some crumpets, or roasting coffee beans. At other times you'll get to learn about the historical process of making chocolate-YUM! Plan to spend the whole day, and dress warmly. If you're looking for eating options, Conner Prairie's food service staff offer lunch options in the Overlook, which is located upstairs in the Museum Center from 11 a.m. to 2 p.m.
Holiday Adventures at Conner Prairie is open from 10 a.m. to 5 p.m. on the following days in 2015: December 12-13, 19-20, 26-31, and January 2-3 of 2016! Admission is $12/ adult, $9 for youth 2-12, and free for Members. 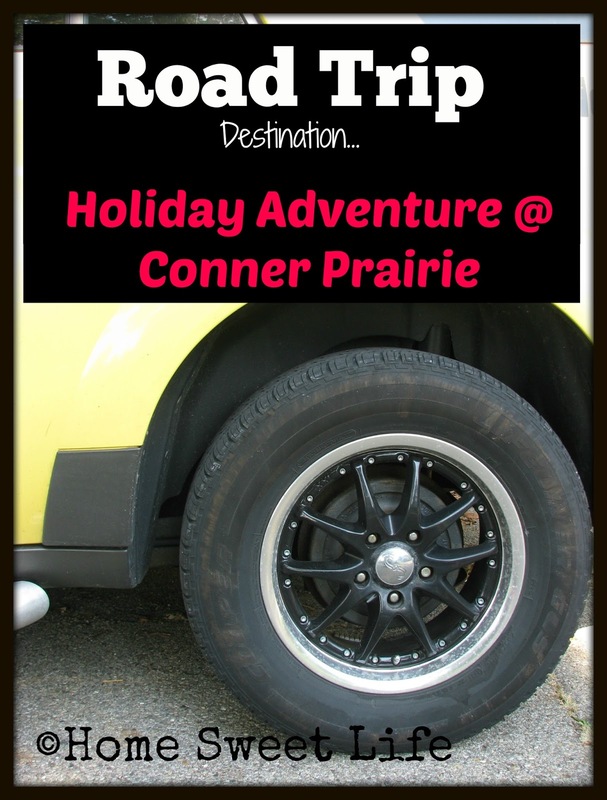 Find all the details on Conner Prairie's website. 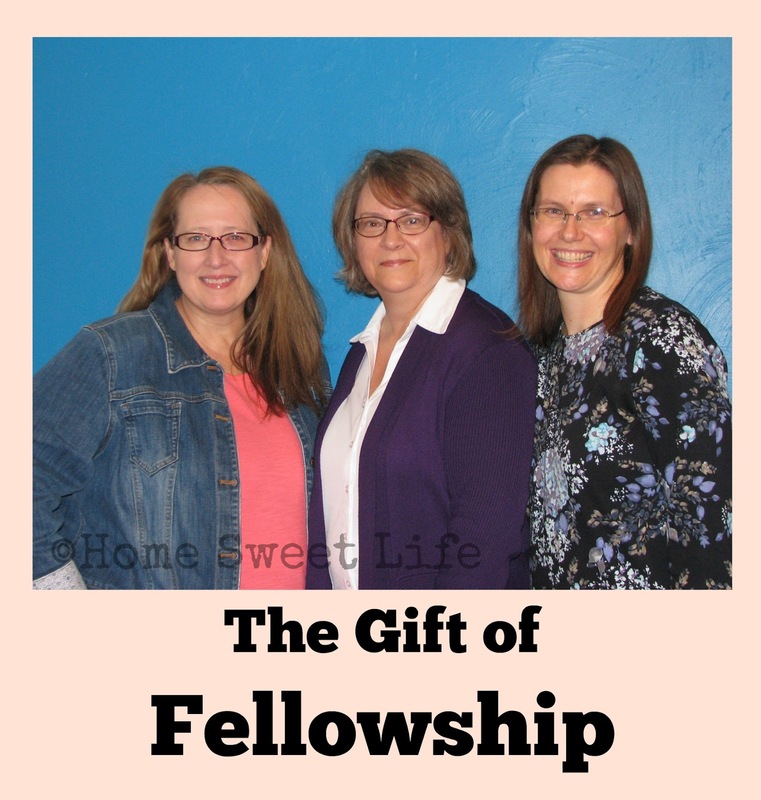 Today I was so thankful for the gift of fellowship! 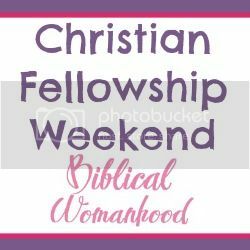 Sometimes as Moms we get so busy doing whatever needs to come next that we forget the joy that comes from true fellowship with other believers. Today I enjoyed wonderful fellowship with some dear, sweet ladies that many of you probably know. My dear friend Marcy blogs over at benandme.com and the other lovely lady in the picture with us is Sharon Watson, from Writing With Sharon Watson. Emily has been using some of Sharon’s various curriculum over the past few years, and had the opportunity to talk with Mrs. Watson at our state’s homeschool convention this past Spring. They hit it off immediately. Sharon is such a sweetheart and loves to hear from students that have used her curricula. She loves to talk to them about quality literature and what they are reading right now. Although Emily had been emailing with Mrs. Watson for quite a while, she asked me if we could get together sometime so they could talk more. Luckily, Sharon lives only about an hour from us, so we invited her over for lunch. Without Sharon knowing it, I also invited Marcy (and her son Ben) over as well. Marcy and Sharon are great friends so I knew it would be a wonderful surprise. We had a simple but filling lunch. After lunch was over Arlene, Ben, and Emily decided to split off from our group and had a fun time talking about Dr Who, drawing pictures, and talking about other stuff. How do I know they were having fun? We kept hearing them laugh from the next room! Marcy, Sharon, and I talked and laughed, and talked some more. We didn’t talk about anything out of the ordinary for us, we just had time to share our hearts. I had such a wonderful time today with these two ladies who have come to hold special places in my heart! I encourage you to take the time to enjoy the gift of fellowship ~ you will be glad you did! 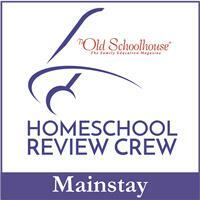 Do you ever wonder who makes up this group of Bloggers we call the Schoolhouse Review Crew? We have some amazing Moms (and a Dad!) on the Crew! We'll be posting a bunch more reviews before you know it ~ we're really excited here at Home Sweet Life about one that's in the works ~ You'll hear more about it soon! 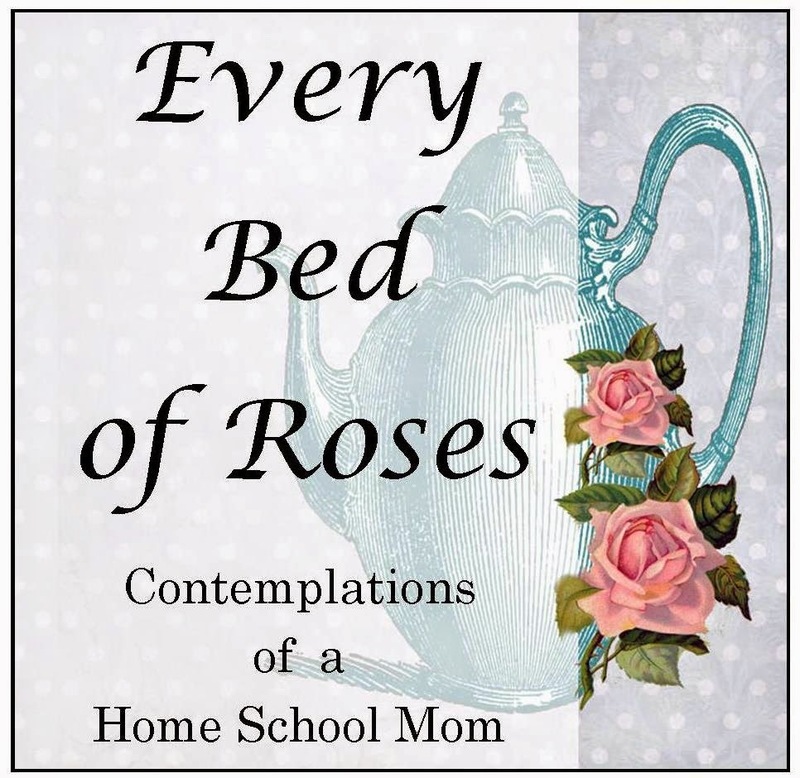 In the meantime, why not click over to some of the other Blogs and learn more about the hard-working, home educating families behind all those reviews! Hope you find encouragement and some great new reads!